the first ship full of men, women and children unrooted from the West coast of Africa, landed in Virginia. The first British settlers had arrived some years earlier. At that time, Virginia was the very first colony among the thirteenth that would found the USA. This colony was established in the south farmland where indigo, rice and tobacco were cultivated (1). Contrary to many population migratory movements, the people from West and Central Africa were deported from their native lands (2). Most of the time, people leave there land for economical or political reasons. In the very case of the African-Americans, people were stolen from their lands. The Europeans helped themselves in «human material». We tend to quickly forget the conditions in which the Transatlantic slave trade was conducted. Roundups were organised in African villages to enslave men, women and children. Families were often torn apart, prisonners would be enchained. Then they would be traded for trinket shimpment, packed in the ship holds for the journey to the other side of the Atlantic Ocean. The fatality rate was an average of 13% during the four centuries of the slave trade (3). Between the XVI and end of the XIX century, 388.744 enslaved Africans arrived in North America (4). The very first African people were about twenty people. They were debarked in Jamestown, Virginia. The Spanish had baptized them before they left their African lands. And, at that time, the British law would not allow the fact that a baptized person could be enslaved. These people would thus become «workers with a contract», and some of them were even able to get their freedom back and own some lands. But settlers soon saw the justice gap since the British law – called Common Law, had specified that African deported people were not considered British citizens since they were born in Africa. As more and more Africans were brought to colonies, slavery was acted in the Maryland and Carolina constitution in 1640. By 1700, slavery was a reality in the whole South with the Black Codes (1856). These codes would specify that African people were slaves for their entire life, in a hereditary way. In the North, the situation was different : masters would consider Black people just like any other workers with a contract, thus, they would be freed when their time of work would have reimboursed their cost. Slaves were not too many in the North. They were able to learn English and to join protestant religious ceremonies. They had access to some education and sociolisation. In the South, Black people condition was not human : they were considered mere goods, they belonged to a master who had every rights on them. They were denied any form of education. Violence, fear and body punishments were used daily in order to make them work as much as possible and thus increase production. It was also a means of keeping them in submission and limit the case of fugitives. Furthermore, because of more colonies being created, plantations were more and more numerous, and more and more slaves were needed. (1) The thirteenth colonies which founded the USA were : Virginia (1607), Massachusetts (1620), New Hampshire (1623), Maryland (1632), Connecticut (1635), Rhode Island (1636), North Carolina (1653), Delaware (1664), South Carolina (1663), New Jersey (1664), New York (called New Amsterdam before 1664), Pennsylvania (1681), Georgia (1732). 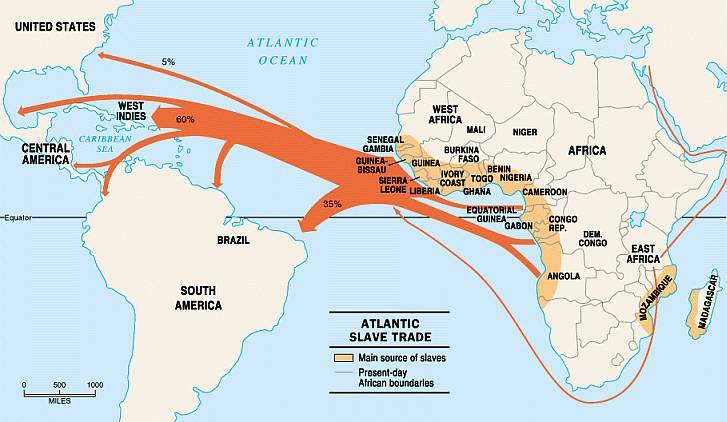 (2) 90 % of African slaves came from : Senegambia (Senegal, Gambia, and Mali, Sierra Leone, Guinea Bissau, Ghana, east of Nigeria, Cameroon, Angola, Congo, Democratic Republic of Congo, Gabon. Sources : California African American Museum de Los Angeles, visite of December 3, 2015. (4) Jamelle Bouie, June 27, 2015 website http://www.fr/story/103551/escalave-infographie. An interactive map made by Andrew Kahn, sums up the transatlantic slave trade. (5) The «Black codes» would deprived Black people from their rights. Between 1830 and 1860 many restrictions were declared. After the Civil War (1861-1865), new black codes were written, with various contents depending on the states. The XIV amendement of the American Constitution voted them illegal in 1868. « Supreme mystery of the sciences of mankind » for Claude Lévi-Strauss, music has been present since the birth of men(6). It is a symbol of mankind, making a clear difference between the animal gender and the human gender. Music has been there since the very first civilisations, allowing them to share, to communicate, to convey feelings and messages. In his writing « As long as there will be human beings» (7), the anthropologist and journalist Régis Meyran explains that, in 40 000 BC, Eurasia was inhabited by Neandertal and Homo sapiens. They were able to develop some music and language. Flutes made of mammoth ivory were discovered from the Upper Paleolithic period. The oldest music instruments found in Europe came from Germany . They were flutes and whistles made of bones and ivory. We have no idea in which background music was born : was it a ritual, religious, therapeutic healing, celebratory context ? This is still a mystery, but it is certain that each of these fiel contributed to its setting. « over the years of human history, prehistorical musics evolved. […T]he history of music is complicated to follow, because it was passed on orally and we almost have nothing written about it. The case of the occidental part of the world is peculiar : aside from popular forms of music, […], academic musics emerged, coming first from religious chants (baroque, gospel, Gregorian), then from secular cultures (Classical, Romantic, Contemporaneous music). In the IXth century, a musical notation system was created, followed by the modern musical stave (XIIth century), and much later on, by a means to record the voice, allowed us to track down music history ». The very first recording attempts started in 1853, but the oldest voice recording known is from 1860 (8). As we will see it all the way through these items, the Afriain-American music nourishes itself from all these traditions. (6) Emmanuel Désveaux, « Claude Lévi-Strauss, Œuvres », L’Homme [En ligne], 190 | 2009, on ligne on May 25 2009, consulted on February 22, 2016. URL : http://lhomme.revues.org/21262 p. 3.